It’s Friday, so lets celebrate with a classic ice cream flavor from Ben and Jerry’s tasty collection. 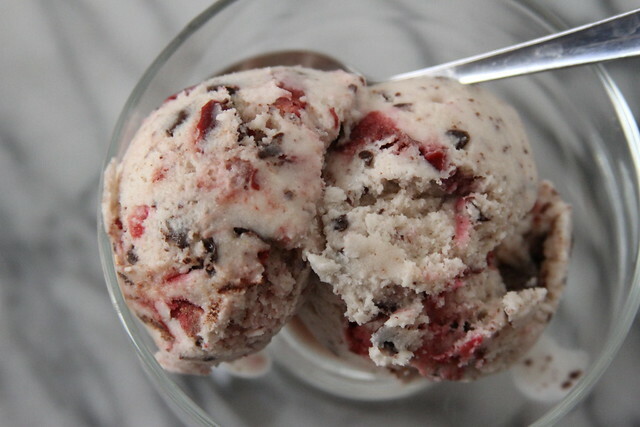 Cherry Garcia has been one of our favorite flavors for as long as we can remember. 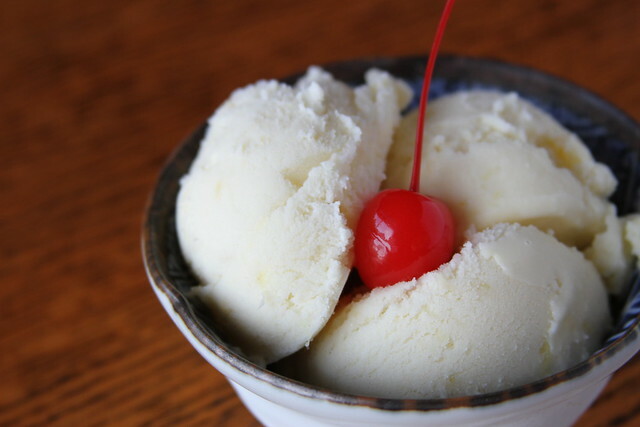 I (Marlee) remember countless summers at the Hollywood Bowl, where during intermission my dessert would be getting a Cherry Garcia Ice Cream Bar and thoroughly enjoying it. Christie was skeptical at first, she hates artificial cherries and cherry flavor, but loves fresh cherries. 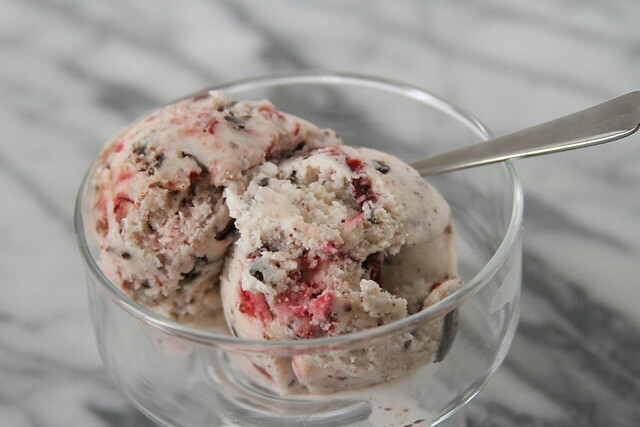 When we first made this for our neighbor (at his request) we decided we needed to buy a small container of Cherry Garcia and break it down to be able to recreate the same flavors. Again Christie wasn’t even sure she wanted to try it because she was afraid of the artificial flavoring, but once she tried it, she was pleasantly surprised that the cherry flavor wasn’t at all artificial and she actually enjoyed it! 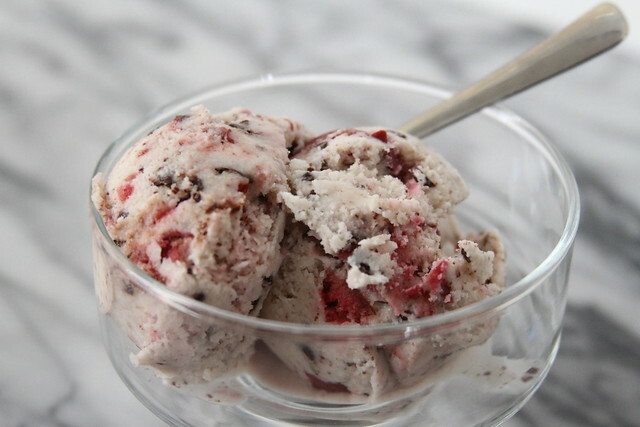 It took a couple of tries, but after adjusting the recipe we came up with something really wonderful that allows the natural flavor of the cherries to shine through and and the chocolate perfectly accompanies it. This is tart, sweet, chocolatey and creamy! 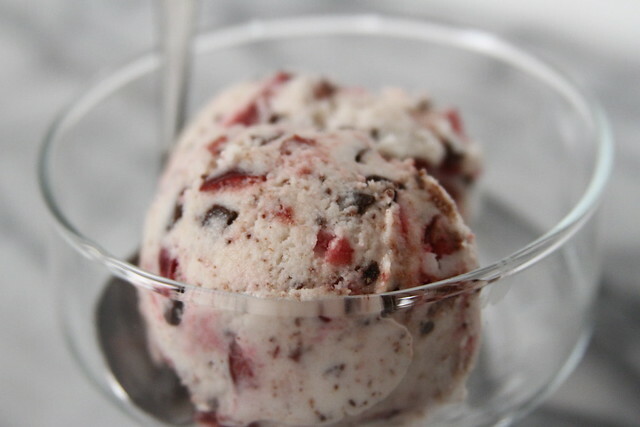 You’ll feel like a regular Ben or Jerry when you make this, so get going! Step 1: Roughly chop and place the dark chocolate into a freezer safe bowl and put in the freezer until ready. Step 2: Using an electric hand mixer beat the eggs until they’re light and fluffy. Step 3: In a saucepan, combine the sugar and milk and heat until just before it boils. Remove from heat. Step 4: Making sure you are whisking constantly slowly pour half of the heated milk mixture into the eggs. Make sure you are whisking constantly so the eggs don’t curdle! Step 5: Add the egg/milk mixture back into the sauce pan and add the heavy cream and cook over a low heat until the mixture has thickened and coats the back of a wooden spoon. Step 6: Remove the mixture from the heat and allow to cool and then move to the fridge to really get cold. Step 7: When the mixture has cooled, add the cherry purée and mix together. Then pour the mixture into your ice cream makers and churn according to manufactures instructions. 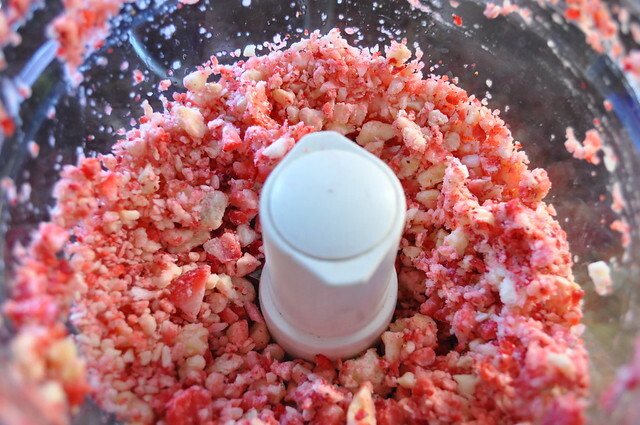 Step 8: Before the last five minutes of churning, add the cherries and the chocolate chunks. While all the other cities are cooling down for fall, LA is heating up for our normal fall heatwave (we call it second summer, if you didn’t melt already…here you go). And because it’s still so hot, we’re giving you more ice cream! 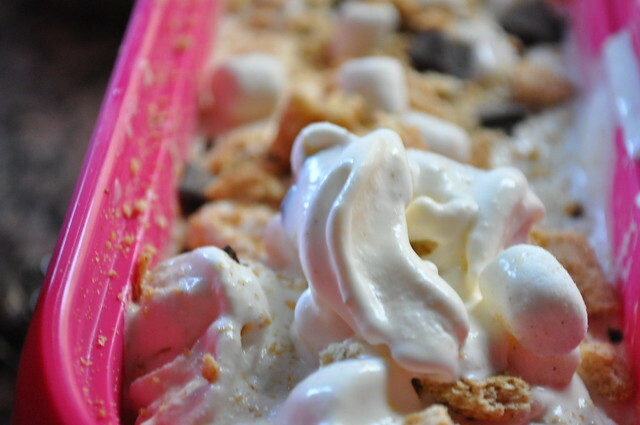 It feels hot enough to roast a marshmallow in the outside air, so we thought we’d make S’mores ice cream. S’mores remind of us summer and camping. Two things we aren’t terribly found of, but we do like chocolate, graham crackers and a gloriously toasted marshmallow. 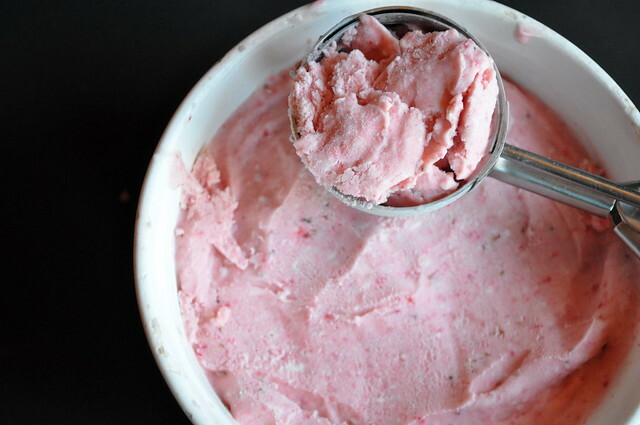 We know it seems intimidating, but making ice cream is totally worth it. 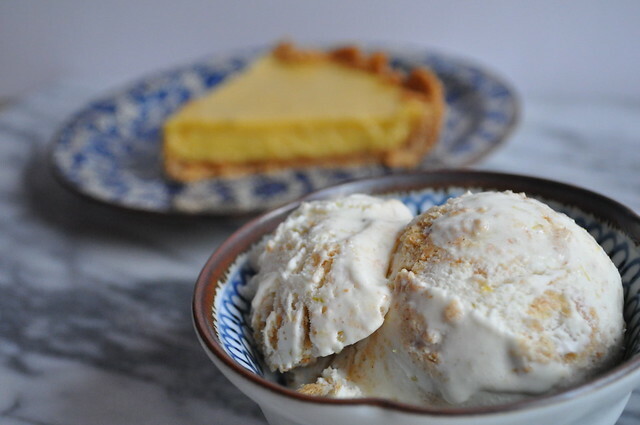 Machines aren’t that expensive, especially on Amazon, and once you find a recipe that works (like all of ours) you will be Ice Cream-Making Wizards! If you really want to be fancy, you can lightly toast the marshmallows before you add them in Step 6. In a large sauce pan, combine the half and half and sugar over medium heat until the sugar dissolves, remove from heat and set aside. Beat the eggs until light and fluffy, about three minutes. Very slowly, pour about half of the heated half and half mixture into the eggs whisking constantly. Pour the mixture back into the saucepan and place on the stove over medium-low heat. Next, add the heavy cream and marshmallow fluff and stir until smooth. When the mixture has thickened and coasts the back of a spoon remove from the heat and transfer to glass jar. Allow to cool to room temperature then transfer to the fridge for at least 12 hours. When cool, make according to your ice cream makers manufactures instructions. 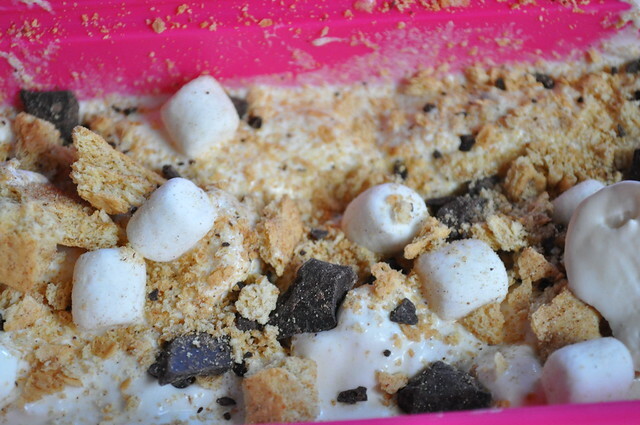 During the last five minutes of churning, slowly add the crushed graham pieces, marshmallows and chocolate until combined. 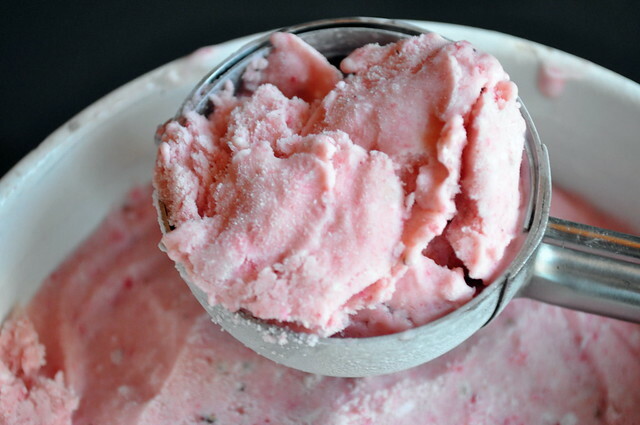 Transfer to a freezer safe container and let firm up for at least three hours, then enjoy! Here in LA we are experiencing some major summer heat. The past couple of days have been brutal. So brutal that we haven’t even been in the kitchen because it’s just too hot (this is what it’s like living with no Air Conditioning). 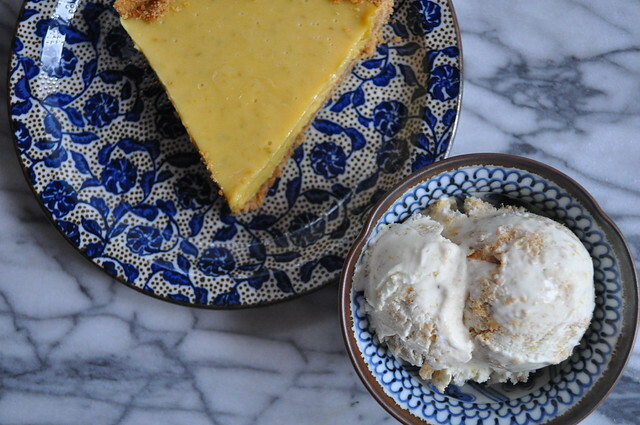 So instead of cooking over a hot stove, cool down with this tangy and tart summer treat. 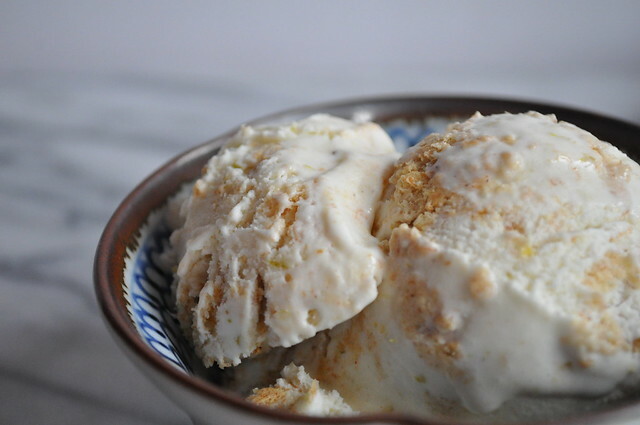 Key Lime Pie Ice Cream is perfect for those who love ice cream but aren’t fans of the overly sweet stuff. Now, you may be thrown off by seeing vodka in the recipe, but don’t be! Vodka can’t freeze, so adding it to your base will help make it smooth and creamy. In a medium bowl, mix together the milk, half and half, vodka, and cream together. Add the key lime juice and zest and stir until thick, smooth and creamy. Pour into a jar and allow to chill for at least 30 minutes. 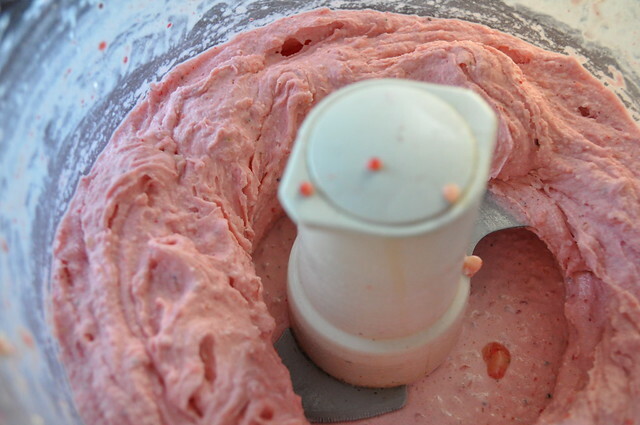 Next, pour the mixture into your ice cream maker and churn to your manufactures settings. 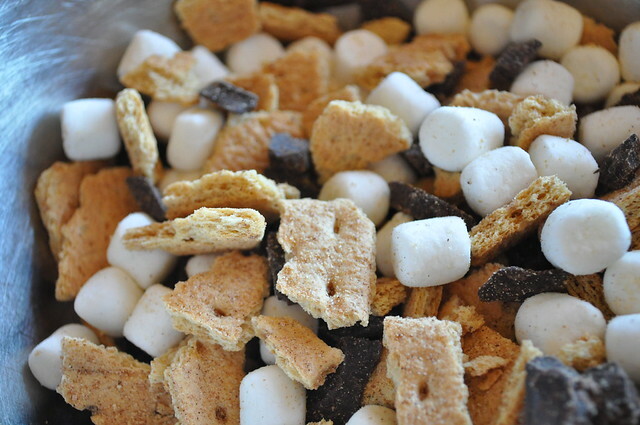 In the last five minutes of churning add the graham cracker pieces and let mix in. Transfer to a freezer safe container and freeze for at least three hours to firm up. It’s National Ice Cream Day! And here at Two Young Ladies, we LOVE ice cream. We love making it, and we of course, love eating it. 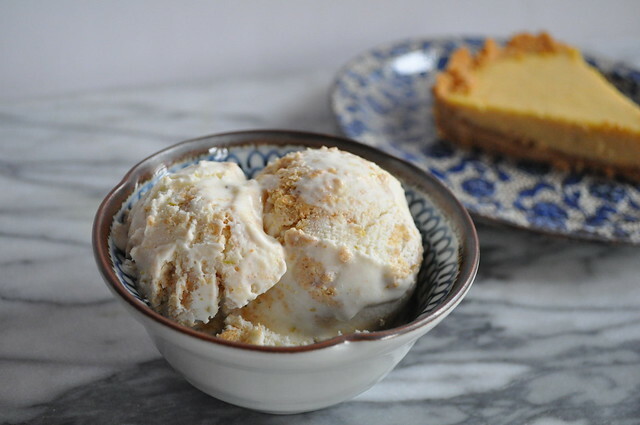 We had so many different ice cream recipes to post, but we thought we would mix it up, and post a healthy version of a classic. What? Healthy ice cream? 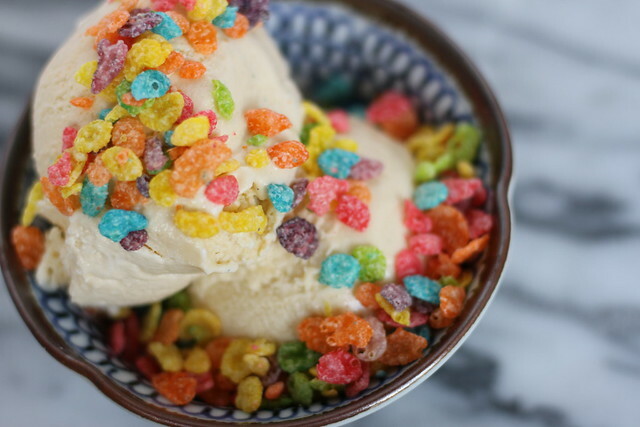 No your eyes did not deceive you, and the best part is, you don’t need an ice cream maker! Yes, this ice cream churn free. 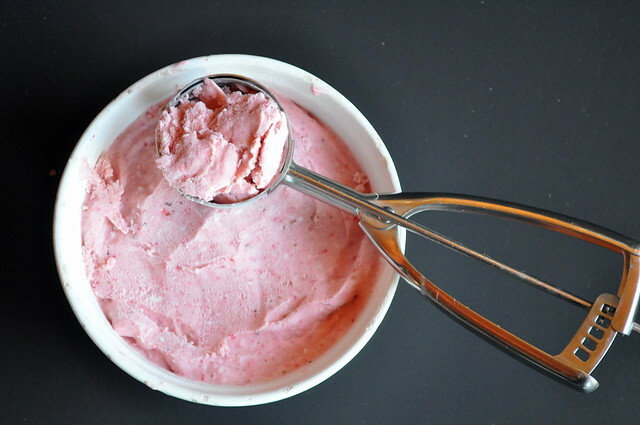 All you need is a food processor. If you can’t have heavy cream, you can use coconut milk or your favorite non dairy substitute. 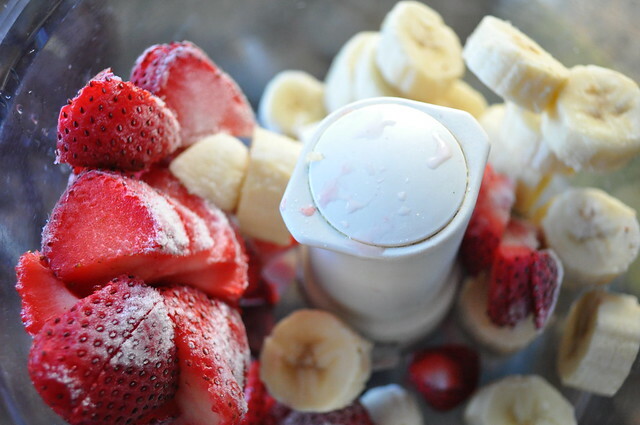 THE NIGHT BEFORE you want to make this, slice your strawberries and bananas and put them in the freezer to freeze. 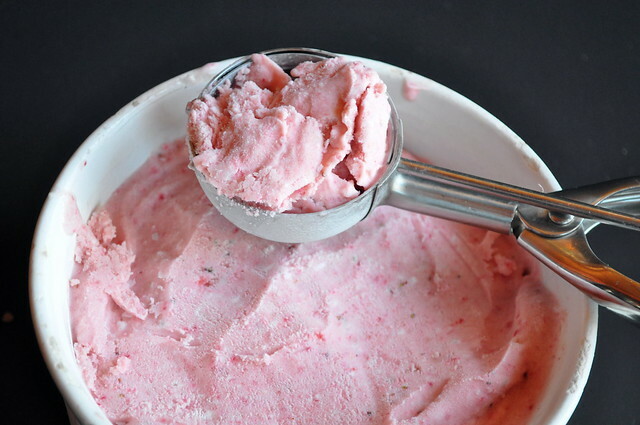 When you’re ready to make your ice cream, put the bananas and strawberries in a food processor. Pulse until the bananas and strawberries have broken up. Next, add the zest, extract, and sugar. Pulse until combined. With the food processor running, slowly add the heavy cream. Pulse until smooth. Transfer to a freezer safe container and enjoy! 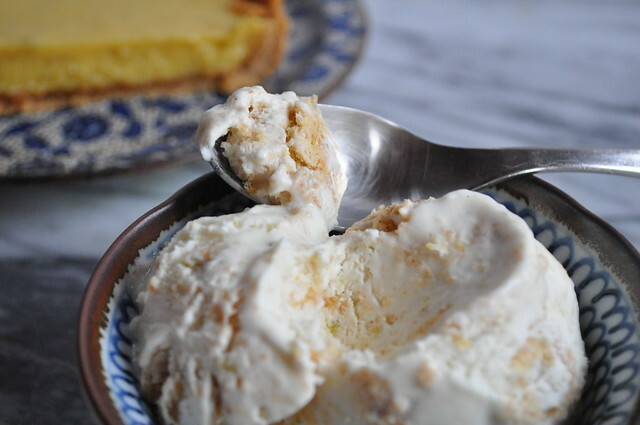 Banana pudding is considered a Southern staple, but apparently it was created in New York and adopted by the south! Bananas started becoming a star at fruit stands only after the Civil War, when goods were capable of being transported from the Caribbean and Central America much faster. The first printed recipe of Banana Pudding was actually in the New England magazine, Good Housekeeping, and was compared to an English trifle. Like trifles, they originally used sponge cake, but in 1920 a more affordable option was used: Vanilla wafers, or as most know them as Nilla wafers. 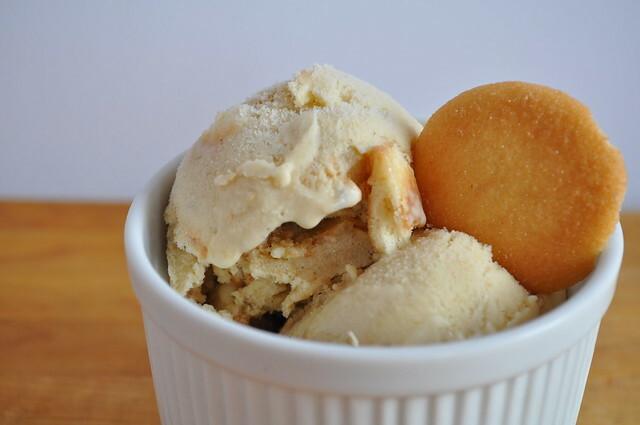 So today we give you our Southern (California) Banana Pudding ICE CREAM! Yeah, you heard right, we made a dish that was already devilishly delicious into something truly diabolical! You feel compelled to have more and more, especially after some salty, savory, succulent BBQ food. It’s the perfect companion to anybody’s 4th of July BBQ extravaganza, so get started people! **If you don’t have Vanilla Bean Paste, extract can be used in its place. In a saucepan, combine half and half, sugars, salt and vanilla; turn on the heat to medium-low and stir occasionally until the sugar is completely dissolved (about five minutes). In a medium bowl, beat the eggs using an electric mixer until they are a pale yellow. We like to beat them until they achieve the “ribbon stage”. When the sugar has dissolved, very slowly pour half of the cream and sugar mixture into the eggs; whisking constantly so the eggs don’t curdle. Transfer the egg mixture back to the sauce pan with remaining cream mixture. At this point, mix in the heavy cream and the vanilla paste. Cook the mixture of a medium-low heat until the mixture thickens and is able to coat the back of a wooden spoon; about five to ten minutes. If needed, pour the mixture through a fine wire sieve. Cool the mixture to room temperature. While your base mixture is cooling, take your very ripe bananas (the darker the better) and mash them well. Set aside. 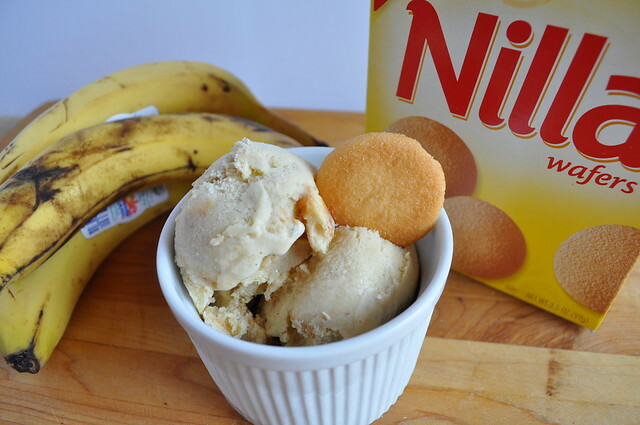 When the base mixture is cool, stir in the banana mixture and pour into your ice cream maker. Freeze according to the manufactures setting. 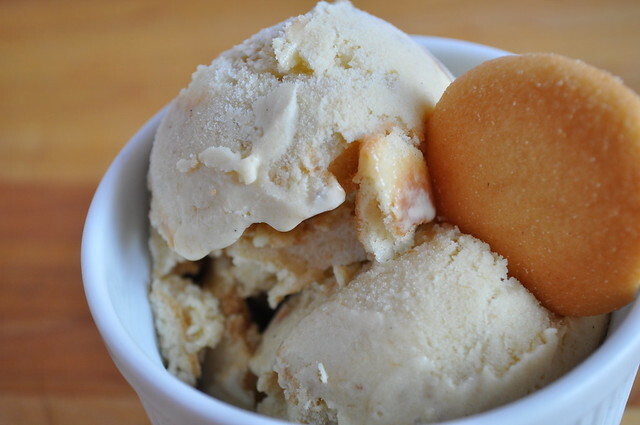 While the ice cream is freezing, gently crush your vanilla wafers. During the last five to minutes of the freezing process, mix in most of the wafer cookies. When the mixture is finished, transfer to a freezer safe container. Top with leftover crushed cookies. Freeze until firm and serve.